Jack Black stars as a diehard rock guitarist-turned-substitute teacher who transforms a class of fifth graders into a high-voltage rock group. His lesson: to lead the kids on to victory in the local "Battle of the Bands" competition. $19.622 million on 2614 screens. Some films sneak up on audiences. A good example of a “sleeper” hit, 2003’s School of Rock proved to be a surprisingly loose and fun little comedy. We meet an obnoxious rock guitarist named Dewey Finn (Black). He bums off his buddy and roommate Ned Schneebly (Mike White), whose domineering girlfriend Patty (Sarah Silverman) pushes Ned to grow some nads. Dewey thinks his group’ll win the Battle of the Bands and then he’ll become a success, but unfortunately, he gets bounced from No Vacancy. When Horace Green Prep School Principal Mullins (Joan Cusack) calls to get Ned to substitute teach for an extended period, Dewey smells much-needed money and pretends to be his roommate to land the gig. He teaches a class of fifth graders and initially fails to take the job seriously at all. Dewey’s attempts to field a new band fail, but he gets an idea when he hears the kids play in their music class. He fits them in to rock instruments instead, and for the kids not in the band, he assigns them jobs like roadie or costume designer. The rest of the film follows Dewey’s attempts to make the kids into a real band and win the Battle all while he keeps everything a secret from Mullins, the kids’ parents, and others. To say the least, Rock presents a thin plot. It also displays many of the clichés of the genre as it progresses down a very predictable road. Does anyone doubt that Dewey will mature and become more responsible all while the kids learn lessons as well? Does anyone not anticipate all of the obstacles that will make it tough for Dewey to succeed? I doubt it, for Rock telegraphs all these moments far in advance. But you know what? Rock presents such a frisky and fun comedy that I don’t care about all the trite elements. Probably the flick’s most egregious misstep comes from offering Billy the costume designer. The overtly effeminate boy seems like a tired trick and the character really comes across as nothing more than a tired stereotype. The movie largely avoids other such characterizations among the kids, so this one feels all the more painful to see. Otherwise, Rock offers one big ball of fun. Black will probably always be a “love him or hate him” performer, and those without an affection for him likely won’t change their minds via his wildly over the top routine here. Black doesn’t even remotely attempt to play Dewey as a real person; he goes so wild that it seems likely he’ll explode at any minute. Nonetheless, the performance works for the part. Frankly, I find it tough to cite why Rock does work so well. My notes focus on remarks like “nothing remotely revolutionary about the flick – even has an ‘everything coming together’ montage – but a lot of fun”. And that’s the key to it. School of Rock offers one of those “whole greater than the sum of its parts” flicks. You can’t dissect it and expect it to hold up to scrutiny, as much of it doesn’t work individually. But as packaged together, the movie seems lively, amusing, and likable. Don’t question it – just go with the flow and have a good time. 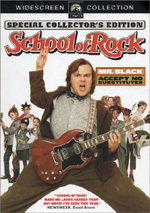 School of Rock appears in an aspect ratio of approximately 2.35:1 on this single-sided, double-layered DVD; the image has been enhanced for 16X9 televisions. For the most part, the movie looked fine, but it didn’t present a terrific picture. Sharpness varied somewhat. Much of the movie came across as reasonably concise and well-defined, but some exceptions occurred. Wide shots occasionally demonstrated moderate softness and seemed less distinctive than I’d like. No issues with jagged edges or moiré effects popped up, but the movie demonstrated light edge enhancement. Other than one small scratch and a couple specks, I noticed no signs of source flaws. Colors generally appeared accurate. Flesh tones appeared a bit pinkish, but otherwise the tones were fairly lively and smooth. The movie favored a natural look and pulled off the hues well. Blacks seemed firm and dynamic, while low-light shots appeared clean and well developed. Too many issues developed for the movie to earn a grade above a “B-“, but it remained acceptable across the board. Similarly, the Dolby Digital 5.1 soundtrack of School of Rock was fine but unspectacular. Given the film’s genre, I expected a low-key soundfield, and that’s what it delivered. The audio remained heavily oriented toward the front spectrum. Music was the most important elements, and those pieces showed good stereo delineation and separation. The moderate use of effects demonstrated solid placement and movement when appropriate, though they played a pretty minor role in the proceedings. The surrounds bolstered the presentation to the mild degree, but that was about it; I never noticed any unique or important embellishment from the rear speakers. Rock demonstrated fine audio quality. Speech consistently came across as natural and concise. I noticed no issues connected to intelligibility or edginess. Effects sounded clear and firm, with no distortion or other problems. Music varied somewhat dependent on the source material, but the songs generally appeared vivid and dynamic. Bass response was warm and tight. Nothing about the audio of Rock stood out, but it worked fine for this sort of program. For this DVD’s extras, we start with an audio commentary from director Richard Linklater and actor Jack Black, both of whom sit together for this running, screen-specific piece. They offer an enjoyable track, but not one that reveals a lot of useful information. We do find some notes about how both men came onto the project, and we also learn a bit about the cast, the shoot, locations, deleted segments, and other elements. However, the tone remains pretty superficial across the board and rarely comes across as terribly informative. A lot of praise for the flick and various participants appears. Both men seem lively and banter nicely, and Black provides enough funny bits to make the track worth a listen, but don’t expect to learn much from it. In addition, we get a Kids’ Kommentary with young actors Robert Tsai, Kevin Clark, Joey Gaydos, Miranda Cosgrove, Rebecca Brown, Maryam Hassan, and Caitlin Hale. All of them sit together for their running, screen-specific piece. As was the case with the youngster track on Holes, this one sounds like a good idea but fails to offer much useful information. The kids mainly a) talk about how much they like the movie and the folks involved, b) quote lines and laugh at the flick, and c) rag on each other. Poor Tsai gets the brunt of this, as the kids badger him due to his quietness. Occasional tidbits of information emerge, such as notes about unused material and how the kids dealt with their on-the-set tutors. Mostly, however, this unstructured piece feels like little more than a Saturday matinee with some chatty kids. Don’t expect to get much from it. In Jack Black’s Pitch to Led Zeppelin, we see a three-minute and 35-second piece of begging by the actor. As Black notes at the opening, Led Zep don’t often cede rights to their songs, so Black taped this piece to persuade them to allow the use of “The Immigrant Song”. It’s a fairly entertaining and cool addition to the package. After this comes a documentary called Lessons Learned in School of Rock. It runs 24 minutes and 49 seconds as it packs a few movie shots, clips from the set, and interviews. We hear from actors Black, Tsai, Clark, Gaydos, Cosgrove, Brown, and Hassan, director Linklater, writer/actor Mike White, and music consultant Jim O’Rourke. They cover topics like the origins of the script, casting, rehearsal, shooting the climactic Battle, and why there’s no “the” in the title. Frankly, not much real information appears here, as we instead get a mix of details and general praise. However, the piece includes lots of good behind the scenes footage, and those elements make this a fun program to watch. Don’t expect anything revolutionary from the “School of Rock” music video. It mixes movie clips and specifically shot bits with Black, Cosgrove, Gaydos, Hassan, Clark, Tsai, and Brown. Essentially we just watch Black as he gathers the kids to go to the Battle of the Bands. It’s simple but moderately effective. Next comes the Kids’ Video Diary: Toronto Film Festival. This eight-minute and 13-second program shows Brown, Gaydos, Cosgrove, Clark and Tsai as they go through the day of the film’s premiere. We follow them through the day and also hear a little from some of their moms, Black, and Sarah Silverman. It’s fairly insubstantial but entertaining. For the final video piece, we get MTV’s Diary of Jack Black. It lasts 16 minutes and 32 seconds as it follows Black through his day on August 16, 2003. It presents some real events with many contrived ones as well as humorously self-aggrandizing comments from Black. It also includes some Rock clips, since it clearly exists to promote the flick. It’s sporadically entertaining and that’s about it. 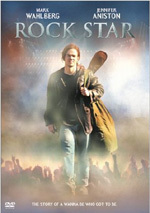 In addition to the trailer for Rock, the DVD includes some Previews. This area presents ads for Timeline and The Stepford Wives. It also offers the VH1 “Save the Music” public service announcement that precedes the movie. As usual, Paramount includes English and French subtitles for the majority of the visual extras. Disappointingly, though we hear a lot about deleted scenes, the DVD doesn’t actually include any of them. Lastly, we locate some DVD-ROM extras. “Chalkboard of Rock” springs into three subsections. We can jump to the portion of the audio commentary that discusses the film’s chalkboard, or we can watch Jack Black discuss his four favorite bands in a video clip. Finally, “Dewey Finn’s Chalkboard of Rock” offers a fairly cool way to learn a little about a lot of acts. It replicates all the musicians listed on the movie’s board, and when you click on them, you get short but fairly decent biographies of each. It’s a very fun and creative feature. The “Web Site Archive” puts the whole School of Rock page on the DVD. I didn’t see anything terrific there, but it’s still a nice addition to the set. Nothing about School of Rock seems revolutionary or particularly creative, but it doesn’t really matter. The movie balances charm and funny bits to create something predictable but wholly entertaining. The DVD provides decent but unexceptional picture and sound plus a roster of extras that appears fairly long but comes across as fairly bland. This DVD doesn’t excel in any way, but it functions fine as a whole, and the movie itself is fun enough to merit a recommendation.